PIZZA TEEN! : M.C. 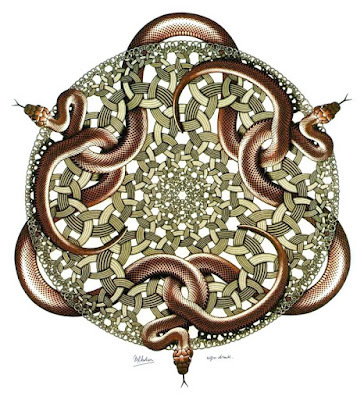 Escher Creates And Prints "Snakes"
I hope we can all finally agree that Escher's stuff is great. He's one of those guys like Norman Rockwell who was dismissed for decades by art world insiders as merely a popular graphic artist or illustrator. Escher's stuff is a pleasure to look at, and that's perhaps the finest quality an artist can aspire to. Here he is at work creating and printing "Snakes" in 1969. This was his final print. He died in 1972. The video has no sound.